Is Your Dog Afraid of Stairs? Is your dog afraid of the stairs? Some dogs are afraid of going up and down stairs. This is a fairly common fear or phobia, especially in young dogs who may not have encountered them while they were puppies. Fortunately, you can help your dog get over this fear and go up and down the stairs with confidence. Here's what you need to know if your dog has a fear of the stairs. Before you begin searching for behavioral issues that may cause a dog's fear of stairs, talk to your veterinarian. Your dog's fear may stem from a physical problem. He may not want to go up and down the stairs because it causes him pain (in cases of arthritis or an injury). Have your veterinarian rule out a medical condition before you start any training. The majority of dogs who are afraid of stairs develop the fear because of a lack of early exposure. 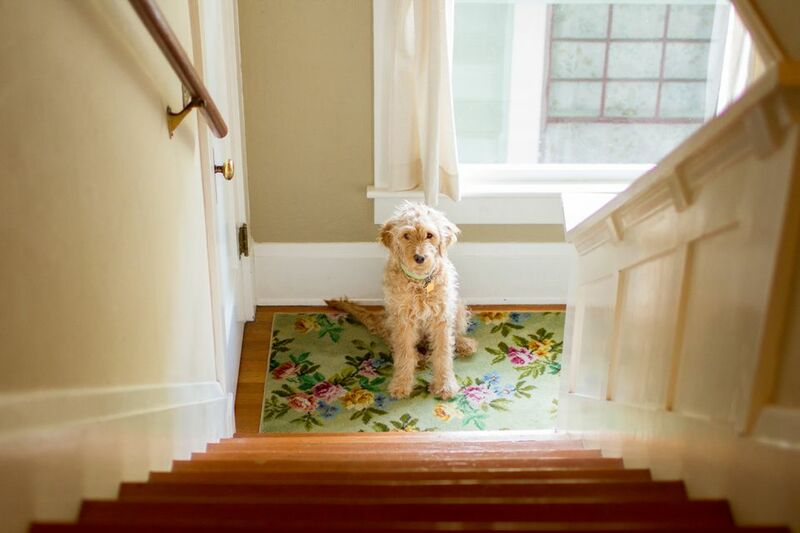 If you live in a single story home, it's possible that your dog won't see stairs until a little later in life. You may even discourage your puppy from going on the stairs to keep him contained to a single room. In some instances, a dog may develop a fear of stairs from a traumatic experience. For example, a dog who falls down the stairs may be left with a phobia of climbing stairs. Clear off the steps. Make sure there is nothing on the stairs that your dog can trip over or knock over. Being startled in this manner could cause a major setback in your training. Distract the fearful dog. Rather than making a big deal of trying to force your dog up and down the steps, you can try tricking him into going up or down by distracting him a little. Pat your hands against your legs, talk to your dog in a happy tone and give him lots of attention. Take a step up one step and then back down as you continue the happy talk. Sneak in a few of your dog's favorite treats here and there. Next time go up a few steps and back down. For a mild phobia, you may be able to get the dog to follow you up and down a few steps without even realizing it. If you manage to get the dog on the steps, be sure to give lots of praise and some treats. Gradually work on coaxing the dog a little further each time. Take it one step at a time. An entire staircase might be too much for your dog to handle, but chances are he'll be okay with one. If his fear is mild, just pick him up and put him on the first step. Wave a few treats in front of his nose, and lure him down the step. Again, use lots of positive reinforcement to encourage him. Once he is comfortable with a single step, move him up one more, and lure him down with treats. In this manner, you should be able to gradually get your dog comfortable with navigating the stairs. Reverse it to go up the stairs. You can do the same steps as above to teach your dog to go up the stairs. Start by giving him treats when he is at the bottom of the stairs. Next, toss a few treats on the bottom step. Once he is comfortable taking those treats, toss some treats on the next step. Gradually work on getting your dog to step up the stairs to get the treats. Before you know it your dog will be navigating the stairs like a pro! Remember to be patient with your dog. Depending on his level of fear, it may take some time for him to get comfortable with the stairs. Work in short, upbeat training sessions. If your dog seems overwhelmed, frustrated, bored or stressed, it's time to end the session. Always try to end on a positive note. If you find that your dog's phobia is too intense to overcome, it's a good idea to seek help from a dog trainer or behaviorist. You can ask your vet for recommendations to help you find the right professional. Is Your Dog Afraid of Certain Objects?